"...a conversation with Satya Nadella, the C.E.O. of Microsoft. It was recorded in September, 2017, soon after Nadella published a book, called Hit Refresh: The Quest to Rediscover Microsoft’s Soul and Imagine a Better Future for Everyone." A special annotated version of the book was provided for every of Microsof't's 120K employees. "...job No. 1 for a CEO should be to curate a company's culture." 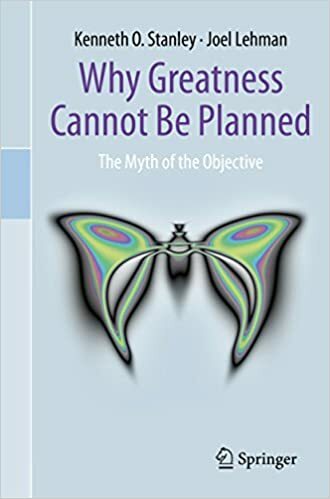 "Stanley is also the co-author of a book entitled Why Greatness Cannot Be Planned: The Myth of the Objective - a book ... recommended to anyone interested in innovation, public policy, and management. Inspired by Stanley’s research in neuroevolution (into topics like novelty search and open endedness), the book is filled with examples of how notions first uncovered in the field of AI can be applied to many other disciplines and domains." "The quest to evolve neural networks through evolutionary algorithms." without protecting individual autonomy, collaboration can be dangerously objective. "...is a collaborative art application based on an idea called evolutionary art, which is a technique that allows pictures to be bred almost like animals."